The stronger ties between Disney and regional streaming service iflix have resulted in a lot of interesting new TV shows and movies added to the streaming library. And thus I'm now able to play catch up with a variety of Disney programming that I didn't get to watch on TV or in the theater. It's a mixed bag of the good, the bad and the ugly, in a manner of speaking. I didn't know enough about the source material that John Carter had been based on to be excited about the movie when it first came out, but it was hard to miss the promotional trailers given how hard Disney had been trying to market the movie at the time. It's clear that Disney had a larger movie franchise in mind for John Carter based on the marketing efforts and the many stories they could draw upon for this franchise. But the actual movie was a little confusing and quite a narrative mess such that it's obvious why the franchise has no continued on beyond this first foray. 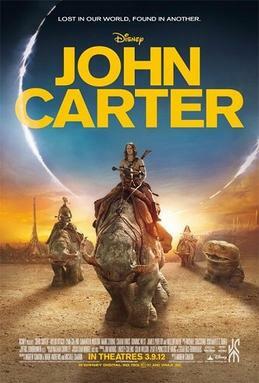 Synopsis: John Carter is a 2012 science fiction movie directed by Andrew Stanton. The screenplay was written by Stanton, Mark Andrews and Michael Chabon as roughly based on A Princess of Mars by Edgar Rice Burroughs. The movie centers around John Carter (Taylor Kitsch), a former American Civil War Confederate Army captain who accidentally triggers a medallion that transports him to the world of Barsoom (actually Mars). There the relatively lower gravity of the planet gives him the ability to jump much further than he could back on Earth and to demonstrate significant feats of strength. But this doesn't help him evade being captured by Tars Tarkas (Willem Dafoe), a member of the Thark tribe of four-armed Martians. Politics on Barsoom/Mars is complicated as the human Red City of Helium has been at war with the Walking City of Zodanga. Their respective leaders, Thardos Mors (Ciarán Hinds) and Sab Than (Dominic West) are the latest leaders to manage this thousand year old war with the only possible end an arranged marriage between Sab and Princess Dejah Thoris (Lynn Collins), daughter of Thardos. But Dejah is quite spirited and strong-willed and refuses this marriage and runs away from the deal. How John Carter and his superior strength affect the balance of power on the planet is where the movie really gets deep into things. What I Liked: Admittedly, the visuals are pretty stellar and a lot of money went into making the world of Barsoom truly fantastical. The diverse races that vie for power on the planet are all so visually distinct that it makes for some great movie scenes. It's clear Disney spared no expense in trying to make this into a big movie franchise by really pushing the special effects. I can only imagine how fun it must have been for Barsoom book fans to see the world brought to life even with the story being what it was. Throw in a great musical score and it makes for great establishing shots and emotional traveling sequences as well. Just a beautiful world to play in indeed. What Could Have Been Better: The movie's plot is sadly confusing in terms of how it was presented to viewers and made it difficult to figure out what's going on. I can only wonder if the writers hoped that more people would be familiar with the original Barsoom stories to a greater degree in order to skip past a lot of the exposition. But how they managed to screw up establishing their world in a clearer manner with a 132 minute run time is rather unforgivable. As much much as there are a not of interesting actors cast in this movie, a lot of the characters on screen felt flat and somewhat underdeveloped. Combine this with inconsistent pacing and awkward dialog exchanges and the movie just slows to a sad crawl of disappointment. I wanted to like this movie more but it was just too hard to do so. TL;DR: John Carter had a lot of factors in play that could have made it a great movie but instead we ended up with something below mediocre. It just goes to show that a big special effects budget does not automatically translate into a great movie franchise cash cow. Thus the first and last movie in this series can only get 1.5 confusing alien encounters out of a possible 5.